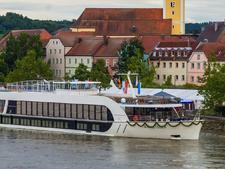 Debuting in 2016, AmaViola is part of the AmaWaterways' European river fleet, which emphasizes immersive destination-focused cruising. 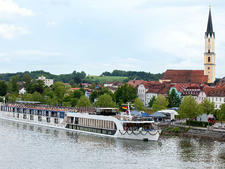 AmaViola is relatively unusual in the river market because it features a handful of connecting cabins as well as cabins that can accommodate three passengers, which makes it a natural for family sailings. Because of a partnership with Adventures By Disney, a few select AmaViola sailings each year are created just for families, with programming on and off the ship meant to appeal to the young and not-so-young. That's not to say AmaViola is strictly a family ship. In fact, on most sailings, you won't see any kids. 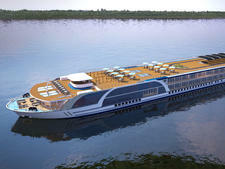 But you will get a cruise that appeals to a wide demographic, thanks to its myriad shore excursion options, which are designed to allow passengers to be as active as they wish. 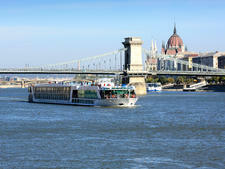 We loved that several activities ashore get the heart pumping, with hiking and biking options in cities along the Danube River. Yet those looking for a more relaxed experience are accommodated as well, so there's truly something for everyone. The boat is elegantly decorated without being fussy. It feels comfortable and is easy to navigate; with only four decks and 158 passengers, you'll know it from bow to stern in no time. Except for the top deck, which is called the Sun Deck, AmaViola's levels are named after musical instruments: Deck 1 is the Piano Deck, Deck 2 the Cello Deck and Deck 3 the Violin Deck. 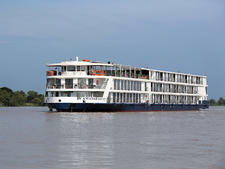 AmaViola has an elevator, but it does not go to the Sun Deck or the Piano Deck, so passengers who can't use stairs should not book cabins on the lowest deck or plan to use the Sun Deck. The common areas on AmaViola have plenty of space and seating, so you won't feel crowded. Cabins are bright and comfortable, though they could benefit from a few more drawers for storage as well as hooks or clotheslines for hanging items. Dining onboard is a highlight, with menus that offer variety even for those with the strictest dietary requirements. And every passenger can book one dinner at the ship's specialty restaurant, The Chef's Table, which offers a tasting menu with wine pairings that feels like a splurge. Service at all restaurants is attentive, and staff members remember passenger preferences from one meal to the next, which makes for a hassle-free experience. 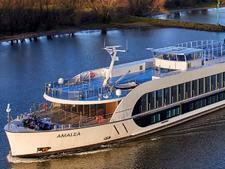 Passengers onboard AmaViola generally fall into the 50-and-older range. 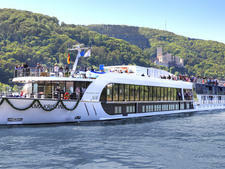 Wine-themed cruises draw a slightly younger demographic. Roughly 80 percent of passengers hail from North America, with most from the United States. 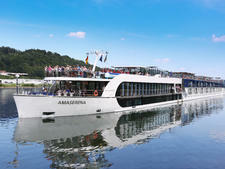 Brits and other Europeans also travel with AmaWaterways, and you'll probably find a few passengers from Asia as well. All announcements are made in English. 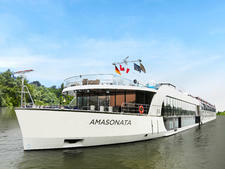 AmaViola hosts several family-themed cruises throughout the year, in partnership with Adventures By Disney, and those sailings skew significantly younger, with children as young as 6 onboard (though the minimum recommended age is 8). 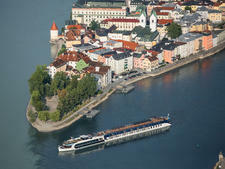 For other sailings, the minimum age for passengers is 4. During the day, passengers dress in casual clothing, wearing mostly items that are appropriate for heavy walking tours. People choose layers and comfortable clothing for excursions. Swimwear and cover-ups are appropriate only for poolside. For dinner, country club casual is standard. That means men wear dress pants and button-down or collared shirts, while women wear dressy pants, capris or skirts with blouses or dresses. At the captain's dinner, offered once a cruise, men might wear jackets and even ties, while women often wear more formal dresses or slacks and blouses. It's not quite black tie, but it's a step up from country club casual. 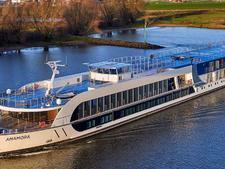 Cruise fares on AmaViola include at least one shore excursions per day; beer, wine and soft drinks at lunch and dinner, as well as bottled water, coffee and tea all day; all meals, including one at The Chef's Table specialty restaurant, Wi-Fi and bicycles for exploring in port. 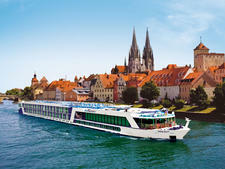 Gratuities are not included in your fare, and AmaWaterways recommends tipping 12 euros per person per day to be divided among the ship's crew as well as 3 euros per person per day for AmaViola's cruise manager, who essentially runs the onboard programming. 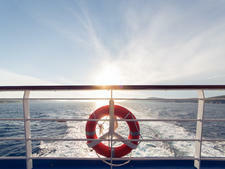 Tips can be paid in cash (the euro is the currency onboard) or by credit card at the end of your cruise. Bar bills and spa services do not include gratuities, but you can tip either in cash or by writing in an amount when you sign for your drink or treatment. Tips for guides and bus drivers during your excursions are not included. Plan to tip 1 euro per person to your guides and bus drivers for a half-day tour, 2 euros for a full day. 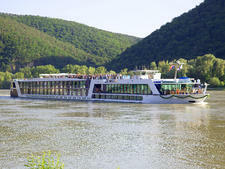 AmaViola also offers excursions that are specialty or premium options, such as a nighttime classical concert in Vienna, that require an additional fee. 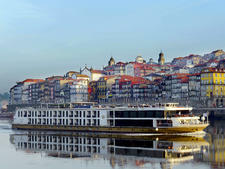 Expect to pay 50 to 75 euros for add-on excursions (at least one daily excursion is included in your fare). 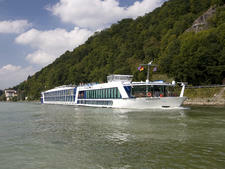 On Adventures By Disney sailings, all tips, including those for Adventure Guides, are included.